The 18th letter of the Hebrew alphabet is tsade (or tzade). It is sometimes called tzaddik צדיק - this is due to the running together of tsade with the letter that follows it when reciting the alphabet - kuf. 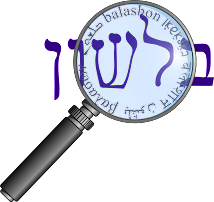 Tsade got its name from the shape of a "fishing hook", trap or a lasso - related to the root צוד - meaning "to hunt, catch, capture". From this root we also get metzad מצד - "fortress", which Klein says originally meant "hunting place". The plural of metzad is mitzadot, but Klein writes that a back-formation was made from mitzadot to mitzada - from where we get the famous fortress Masada. Klein does not connect צוד with ציד - which means "to feed, provide with provisions", but Kaddari seems to indicate there is a connection - a hunt (צוד ) searches for food (ציד). Neither of them make a connection to tzad צד - side (not related) - but Steinberg connects all three. He says a hunter or a trap surrounds the prey on all "sides", which (as Kaddari wrote) becomes the food. Horowitz calls tsade the "triplet letter" - for it originally had three pronunciations - one related to tet, one with ayin (both those letters interchange with tsade) and one that sounds like the current tsade. He provides a number of examples. In Hebrew there are two Phoenician towns called צור tzur and צידון tzidon. But in the Greek translation (which occurred when the differences between the tsade pronunciations were evident) the towns are called Tyre and Sidon. Based on this, he feels there is no connection between three meanings of the root צור - "bind", "to treat as an enemy", and "rock". We saw more of Horowitz's theory when we discussed the word tzvi.